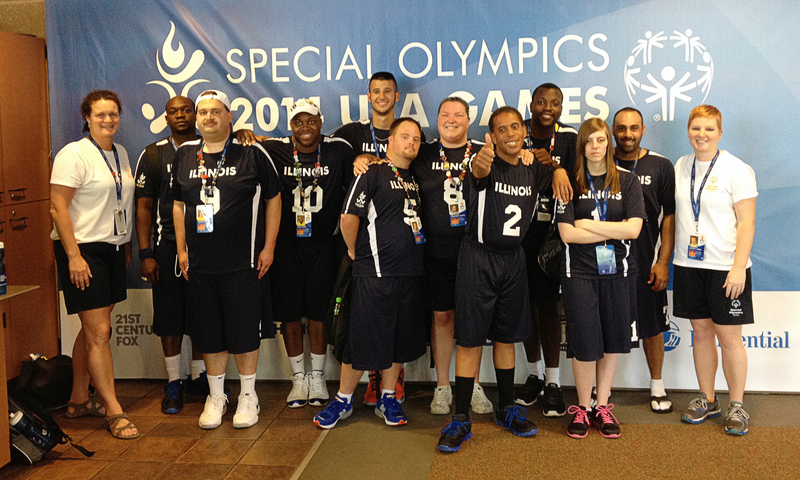 I was honored to be selected as the Head Volleyball Coach for Team Illinois in the 2014 Special Olympics USA Games. Working with this team and traveling with them to New Jersey for competition was one of the best experiences of my life! The athletes selected to the volleyball team put in a lot of hard work. They committed to traveling for monthly practices, making time to train at home around their other sports, and attended two intense training weekends before the USA Games in June. The assistant coach and I asked a lot of the athletes on the Illinois volleyball team and every one of them rose to the challenge of being on a national level team. As a coach, I was excited and nervous to see how the team would do in competition. We would be playing in a noisy crowded gym, and I was hoping the players would stay calm and play our game – passing the ball to the setter, using correct skills, and each individual playing their role to support the team. My team had to trust that I had prepared them to win, and I had to trust them to execute on the court. Seeding rounds were on Monday, the first day of competition. We were put in the highest division, and lost all three scrimmages. That was a tough day. We had a team meeting after dinner and talked about who we were as a team, what we had done well that day, and what we needed to improve on. The next day we were placed in the second highest division. We won all three scrimmages! I was probably most proud of our team on that day because we came back from a discouraging start. That was the day we really became a team. Everyone played hard and unselfishly for the good of the team. Tournament play was on Wednesday and Thursday. We were 6-0 in tournament play, and then won the finals match on Friday morning! It was an awesome feeling to see the players I had grown so close to, be rewarded for all of the hard work they put in over the last six months. I was very proud to be their coach, honored that I could be a part of their team, and a part of experience in all of their lives.